Insurance Package, which is now (as of December 2011) worth P500,000. It is a Comprehensive Insurance and Financial Protection Plan for associates, clients and members of the Caceres Lending Investor Company. 1. To provide a Comprehensive and Exclusive Accident and Financial Plan at the least cost. 2. To promote security and financial awareness among members that will take care of the immediate financial needs of the family in the event of accidents that could result to member's disability and/or death. Accidents happen when least expected and without warning at any time anywhere - on the streets, at workplaces and even in the safety of our homes - to which citizens are exposed on a daily basis. Unfortunately, the great majority of victims and their families suffer the consequential financial distress due to lack of contingency preparation through insurance as many cannot afford the usually high insurance premium cost and therefore remain uninsured. 1) the affected family cannot even afford the final expenses of a decent burial. 2) there's no food on the table. 3) children have to stop going to school, etc. Here is where the importance of insurance protection comes into play - when an insured person dies or disabled due to accidents, the insurance benefit can take care of the immediate needs of the family. And therefore the family is relieved of the immediate financial responsibility because such burden is transferred to the insurer through the GLOBAL MONEY PROTECTOR Insurance Plan. INSURANCE OF THE PHILIPPINE ISLANDS CO., INC. (IPI), was established in 1964 and since then continues to service the Philippine insurance industry. For more than forty four (44) years, IPI has earned the respect and confidence of the industry and its clients with its financial strength, proficient underwriting capabilities and expedient claims settlement. The Company remains as one of the leading insurers in the country today setting a high standard of service and bringing dynamism and innovation to our products and services. Insurance of the Philippine Islands is manned by professionals and top-caliber insurance and finance executives headed by Chairman Hon. Jose Luis Yulo, Jr. (Philippines’ Honorary Consul to Slovenia and former President of the Philippine Stock Exchange and the Philippine Chamber of Commerce and Industry) along with the Atty. Roberto C.O. Lim as President. P125.00 only. Renewal is shouldered by the company through the G-Money Fund. Worldwide, 24 hours a day, on or off the job, for one-year against Accident that could lead to loss of life, disablement (total and partial), blindness, lost of limbs, etc. - including death due to snake bite, dog bite, food poisoning, chemical poisoning or drowning, vehicular accidents and all other kinds of accidents including Unprovoked Murder & Assault (hold-up or other crime that could lead to death). This is yearly and no need to worry about renewal since the company will cover the renewal and will get the P100 from your GM-Fund, which is a monthly allowance of P500. To avail of the medical benefit simply coordinate with the office. The Monthly Cash Allowance and Monthly Grocery Provision are given to the Member who got disabled as well as the family of the Member who passed away. This is monthly and only lasts for 12 months. - Month allowance for hospitalization increases as number of Downlines increases. Maximum of P2,500. - When a Member dies, every Member contributes P50 as assistance to the family. - This is automatically deducted from Member's income. - As our membership grows, the GM Heart Fund would also get bigger. All these from just your one-time P1,000 investment! Add to that the ZERO Interest Loans up to P50,000 and the amazing income potential! This is precisely a Great Value for Your Money! No need to file loan application since will be automatically processed and be delivered also. YOU GET THE EXACT LOAN AMOUNT! Requirements for Loan A) Present any valid ID like SSS, PRC, Passport or Drivers License or ATM Card. B) submit photocopy of Global Money ID 3) Baranggay Clearance or ATM card. A Member must at least have 2 new recruits to avail of the 1st loan. The Member must have at least 2 new recruits first to get the next loan and so with the succeeding loans. If Member has no ID, the usual checking will be done to simply verify address. Member's business or employment background will not be asked. Member will need to get a Baranggay Clearance as well. A "proof of billing address" like Meralco, PLDT or Maynilad billing statements will be sufficient. If the Member is just renting the house or apartment, the member may ask for a certification from the landlord that he or she is a legitimate tenant or occupant of the house. There's no need to file a loan application. Your LOAN will AUTOMATICALLY BE RELEASED TO YOU, whether through your ATM card or you may visit the office to get it personally. Loan payments may be deposited through the bank account of Global Money. Global Money has also added the service of BPI to support our payment transaction needs. Loan payments can be made in any BPI branch across the country. BPI doesn't charge any service fee or transaction fee in any deposit made in any branch across the country unlike other banks who usually charge P50 or P100. Loan payments may be made on or before every 15th and 30th of the month. Length of payment (2 months for 5K, 4 months for 10K and 10 months for 50K) will be upheld to protect the flow of loan releasing and ensure that all will have the chance to avail of the loans. You can pay the loan payments in advance but you will wait for the duration of the whole term to complete before you can file your next loan. You also need to recruit 2 new recruits to get the loan. The sustained recruitment is part of the safety net. In case a Member defaults in the payment of the P50,000 loan, the succeeding income from the growth of the network under these 6 recruits (2 recruits for the 5K loan and 2 each for the 10K and 50K loans) will be forfeited in favor of the company to recover the loss. Penalty for late payment will be adding the number of days as late to the pre-approved processing days (30 days for 1st loan, 7 days for the 2nd and succeeding loans). Example is that if the payment is late by 30 days, it will be added to the normal processing period of 7 days. So, the processing period for that Member's next loan will be, 7 + 30 = 37 days. No penalty charges will be imposed. Keep all your payment receipts too for your protection and record-keeping. For those who failed to pay their loans, they will be terminated from the Membership. The company will forfeit in favor of the company their income from their network growth to recover from the loss. Reschedule of Loan Release - Since our loans are processed automatically once the member gets 2 new recruits and meets the other criteria, a Member may opt to reschedule the release of the next loan if he or she wants to or when the loan is not needed yet. This ensures that the loans are properly utilized and will enable the Member to properly manage it. The Member must inform the office about the reschedule of loan release. The mission of the Global Money Unlimited is to rescue its Members from the enslavement of financial debt by giving them a business opportunity to earn enough to support their family well, so they wont need to borrow money anymore. The loans are designed to simply give the Members, while starting in this business, the needed jumpstart and fix their current liabilities or urgencies. The mission involves securing their family from the burden of a sudden heavy expenditure when a Member dies, through the life insurance benefit and the "Global Money Heart Fund". The strategy is to balance both legs to get the BONUS INCOME, LOYALTY INCOME and including the PROFIT-SHARING. Basic rule is to fill up your Direct Downline for Group A first before you can fill up your Group B. This rule protects the system from unbalanced growth and from disregarding Group A's growth. Remember that you will earn your first P500 from the Group B's own A legs down the line. So, there may be a tendency for some members to forget building their Group A. The rule ensures a balanced growth on both groups. This also ensures a steady inflow of infinite P500 from the Power Potential Income mechanism since all Members must fill up their Group A first in order for them to start growing and earning their own infinite stream of P500. They cannot go to their B leg unless they have already filled up their A leg. The mechanism will ensure the steady inflow of your "infinite P500" or the Power Potential Income. This concept is based on helping other people first before you can earn your income. Every new Member must fill up their first level A Leg first before they can fill up B. When you fill up your leg A, your Upline (and not you) will earn the P500. But once you fill up B, that will be the time you will earn your first ever P500 income from this mechanism. The irrelevance of the Sponsor information protects all the Members from the unfair distribution of the P500 income. The system is founded on helping each other. Naturally, both legs will be filled since the member will only earn from the Power Potential Income (Infinite P500) once he or she is able to recruit 2 persons who will fill up the first 2 legs (Group A and B). Also, for a Member to avail of the Zero Interest loans of up to P50,000, he or she must at least get 2 recruits to fill up their first A and B legs. Weak legs will earn too, no matter what. For your weak legs, you can put your new recruits under those legs instead. They will also earn the P500 and not you. As you can see in the Application Form there is no box for the Sponsor information because it is not needed. Whoever the Upline is gets the P500. Nonetheless, the balanced growth will enable you to get the P20,000 Bonus Income and the P50,000 Loyalty Income. So, if you ignore your Group A's growth, you wont get your Bonus Income and Loyalty Income. This mechanism will help ensure a healthy growth on your 2 groups. It is vital to monitor the growth of both groups (A & B) so you will know where to put your new recruits and in order for you to hit the BONUS INCOME and LOYALTY INCOME. The whole strategy is ensuring the equal growth of both groups to fully enjoy the set of income built into the system. 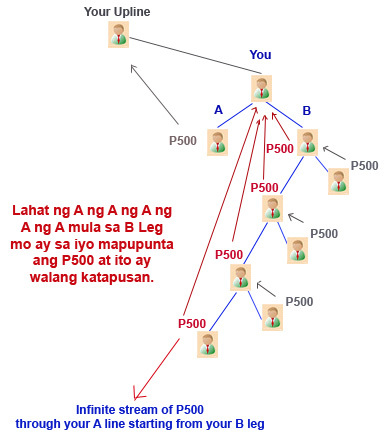 Again, aside from this Bonus Income, Loyalty Income and the Company Profit Sharing, you can expect a weekly income from the INFINITE P500 inflow from all new members connected to the single A line starting from your 1st Level B's leg A. These are all members connected to the single A line starting from your First Level B's leg A, and until the bottom. See BLUE LINE of members in the above image. No need to pair it with another new member in Group A since this is not a pairing system. You earn instantly once a new member links to your A line. Once you have filled up your First Level A and B legs, no need to worry about Group A with regard to earning your unending stream of P500 from the growth of your A line of your Group B, and down the bottom. Remember, you invested only P1,000. When you have already placed 2 recruits to cover your Group A and B, you earn P500. Then when your Group B gets a recruit and puts that new member under his or her A leg, you again earn P500. So, with these 3 recruits in total, (wherein 2 persons were you're actual direct recruits), you have already recovered your investment. What comes next is your unending income inflow !!! 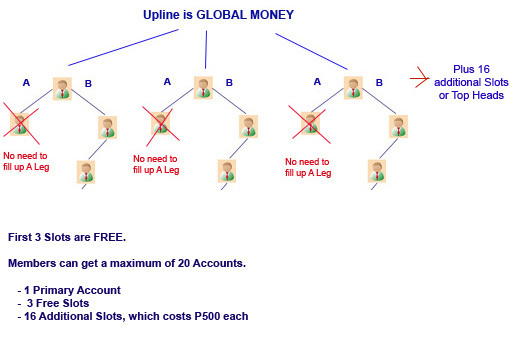 Below is an example of how you can set up your network and earn fast from this INFINITE P500. 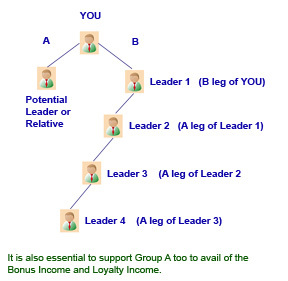 But again, remember to balance both group to earn from the BONUS INCOME and LOYALTY INCOME. You must distribute your leaders evenly on both sides to earn from the BONUS and LOYALTY. Remember that you can help your weak legs (and who are not under your A line) by putting your new recruits under them instead. You will not earn from the infinite P500 but you will earn from the Bonus Income and Loyalty Income. Anyway, there's no "repurchase rebates" in this marketing plan that you see in the typical food supplement business. You earn from the growth of the entire group instead. So, it's a win-win strategy for all. To sum it up, first thing to do is fill in your first 2 Downlines who will create your Group A and Group B, so that you can start earning from the POWER INFINITE 500. Then put all the rest of your next recruits to the "A" line starting from your top member in your Group B. Let the natural growth take its course. If Group A or any leg gets weak, help them by putting all your next recruits under them to ensure your earnings from the Bonus and Loyalty. 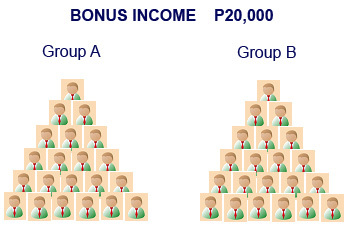 For building 200 on each Group (200 members in Group A and 200 members in Group B), you get a Bonus Income of P20,000. Then if the number doubles, or if it reaches 400 on each side, you'll get P20,000 again. Then if the number doubles again, or if it reaches 800 on each side, you'll get P20,000 again. You get P20,000 every time the number doubles. 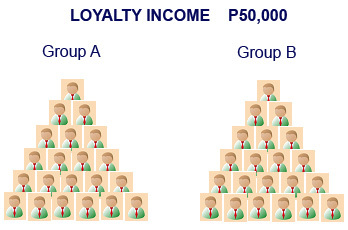 For building 800 on each Group (800 members in Group A and 800 members in Group B), you get a Loyalty Income of P50,000. Then if the number doubles, or if it reaches 1,600 on each side, you'll get P50,000 again. You get P50,000 every time the number doubles and paired by the opposite side. Profit Share is 10% of the P1 Million income. 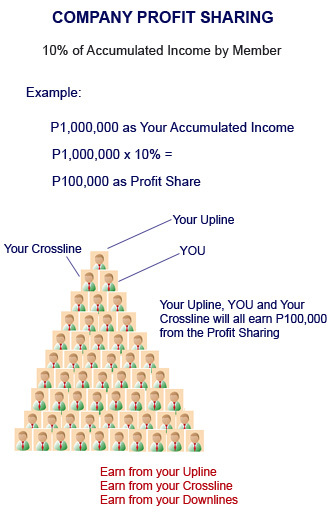 Your Direct Upline, your Crossline, and YOU will all each get P100,000 as profit-share. Basically, to be able to hit P1 Million as company profit, the total income earned by a Member must reach P1,000,000. The Upline and his 2 direct Downlines (Leg A and B) will each get P100,000 for a total of P300,000. Composition varies and this example may not be like the actual performance. P100,000 shall be your income from this Profit-Sharing mechanism. Your Direct Upline and your Crossline (Leg A of your Direct Upline) will get the same amount too. When you get this P100K, that member and the 2 direct Downlines are all qualified for profit-sharing. All 3 on top will have the same amount of income. Profit Sharing for each qualified Member is 10% of Group Sales or Income. P1,000,000 x 10% = P100,000. Each of the 3 will all have this P100K income. The Company Profit Sharing income will be given everytime the your Group Sales hits P1,000,000. Here is the great news. When you qualify for the Profit Share, you being one of his Direct Downlines will earn from that income too. Your Upline gets P100,000 but so will you and his other Direct Downline. For those trying to have an equal share on the group income, the marketing plan does not allow multiple head entry or a "corpo". But they can consider the TRIANGLE on top as the suitable arrangement. It gives the 3 an equal share on the PROFIT-SHARING. For the Profit Sharing, even if one side is weaker than the other, the total number of Members from both will be counted as one big group. This total number will then be used to calculate the income from the Profit Sharing. The Triangle tells one thing. Only a maximum of 3 investor-partners can join the triangle. All Members are entitled to get 3 Free Slots. These are separate trees or network from your original account. These are all accounted to your name. You cannot give these to other Members or new recruits. The Upline for these free slots is Global Money Unlimited itself. No need to fill up the Group A side since. The system simply allows you to fill up B leg immediately so you can start earning P500 as soon get your first recruit for this new tree. The income is same as the Power Potential Income (P500) down the line in A legs. The 3 Free Slots can be used once the Member has recruited 2 persons. Actually, a Member can have a maximum of 20 accounts. 1 primary account plus 3 Free Accounts plus 16 Additional Accounts at P500 each. All the slots in the additional legs will be added to Group B when computing for the BONUS INCOME and LOYALTY INCOME. The 3 free slots add 3 more POWER LINES that you can use to get more income from the Power Potential Income mechanism alone. The idea is when your Primary slot or head is already very big. You can use the additional slots to create more Power Lines. This shall be one of your best strategies. The free slots shall be counted as part of Group B of your primary line, when computing the Bonus Income and Loyalty Income for your primary head. The system gives 3 free slots and another 16 additional slots but you have to pay P500 each for these 16 more slots or heads. These additional slots will boost your income potential due to the increased number of Power Lines where you get your infinite inflow of P500 from. These 20 slots allow you to earn P10,000 daily, P70,000 weekly or P300,000 monthly from the Power Potential Income alone. Plan it well. You can immediately build your free slots to activate more Power Lines. You can also focus first on the primary head to help your leaders within your group to have a good growth while starting. Once, they begin to pick up and earn, you can now start activating your additional slots. Know what's the best approach for your group if you are a leader. Your Downline's success at the start will also result to more income for you in the long run. Friday is the Cut-Off period for membership with regard to income generation. Soon, income will be deposited to your own ATM debit card.